Justin Bieber and Selena Gomez have never been shy about their penchant for PDA. They just can't help showing their love for each other anytime, anyplace, anywhere. On February 17, the lovebirds were photographed in Malibu enjoying a fun afternoon on the beach with JB's family. Later, they were snapped having even more fun making out in front of JB's family. Oops. Damn those paparazzi. On February 17, Justin Bieber, his girlfriend Selena Gomez, and his father and siblings were spotted enjoying a day of sun and surf at Malibu Beach. The über famous teenage stars ate lunch at Paradise Cove and then traipsed down to frolic on the sand. As is their habit of late, Jelena sported similar, near-matching outfits. 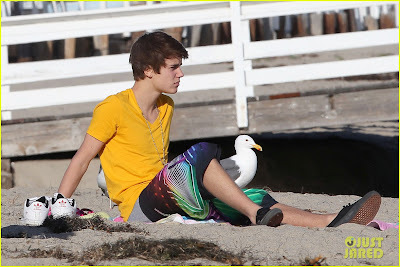 The Biebs wore a bright yellow tee-shirt and a pair of multi-colored shorts. And for once he left his annoying winter knit cap at home. His lady-love rocked a casual but matching yellow sleeveless beach dress. The paparazzi's attire remains unknown, but they were obviously present on the beach since they snapped a plethora of Jelena pics. Maybe they were hiding behind a giant sand castle. The paps that is--not Jelena. Oops, they did it again. Suddenly, there they were--Justin Bieber and Selena Gomez liplocking in a hot and heavy clincher as the sun set over the Pacific. Oh well, the kiddies looked like they were all tuckered out and ready to go home anyway. And Jeremy Bieber hardly seems like the prudish type.